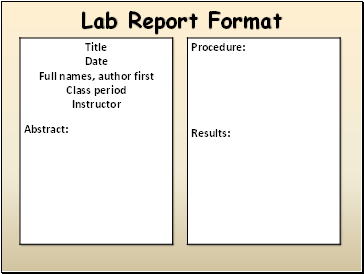 The procedure begins on the second page of the lab report. 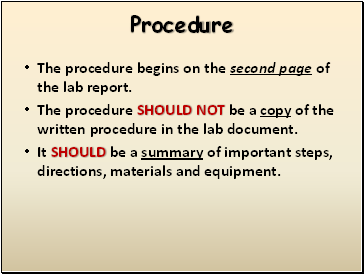 The procedure SHOULD NOT be a copy of the written procedure in the lab document. It SHOULD be a summary of important steps, directions, materials and equipment. It is written so that someone without a science background can understand it. 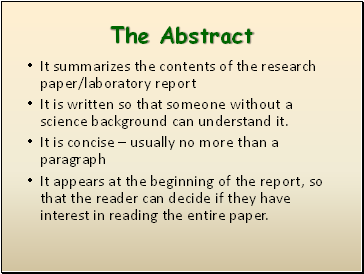 It appears at the beginning of the report, so that the reader can decide if they have interest in reading the entire paper. Background – Define important concepts, theories or laws being examined. 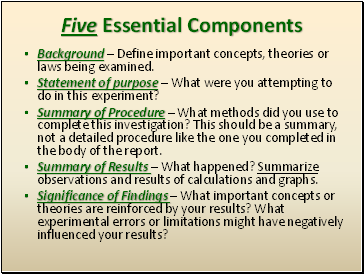 Statement of purpose – What were you attempting to do in this experiment? 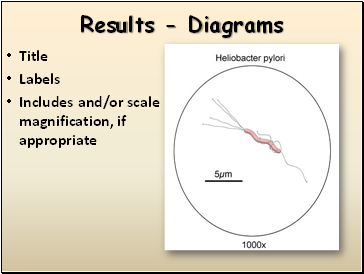 Summary of Procedure – What methods did you use to complete this investigation? This should be a summary, not a detailed procedure like the one you completed in the body of the report. 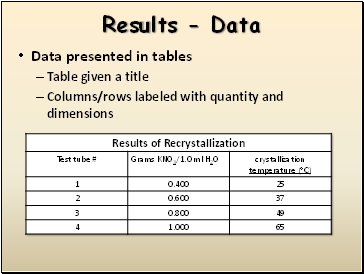 Summary of Results – What happened? 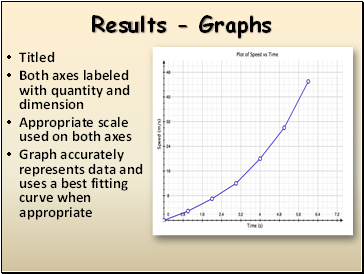 Summarize observations and results of calculations and graphs. Significance of Findings – What important concepts or theories are reinforced by your results? 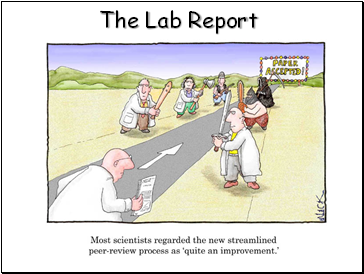 What experimental errors or limitations might have negatively influenced your results? The sweet spot of a baseball bat, like that of a tennis racket, can be defined either in terms of a vibration node or a centre of percussion. 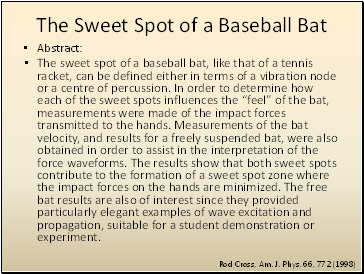 In order to determine how each of the sweet spots influences the “feel” of the bat, measurements were made of the impact forces transmitted to the hands. Measurements of the bat velocity, and results for a freely suspended bat, were also obtained in order to assist in the interpretation of the force waveforms. The results show that both sweet spots contribute to the formation of a sweet spot zone where the impact forces on the hands are minimized. The free bat results are also of interest since they provided particularly elegant examples of wave excitation and propagation, suitable for a student demonstration or experiment.